Good food doesn’t have to be complicated. You can achieve incredible flavor with just a few simple ingredients and the right cooking method. 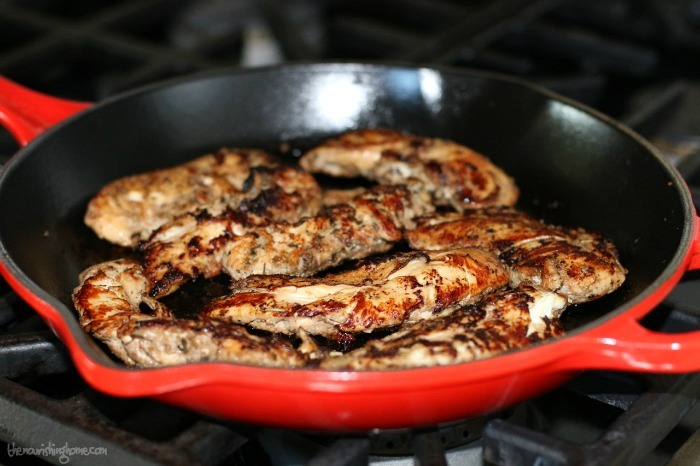 A quick and easy way to achieve moist and tender chicken (that’s melt in your mouth good) is to use a cast iron skillet and pan sear your bird! Pan-searing uses high heat to seal in juices by forming a slight crust. The key to pan searing is to make sure the pan is hot enough, and do not move or flip the meat until it’s well browned and a light crust has formed. When it comes to pan seared chicken, this dish is our absolute favorite. The marinade is a flavorful blend of balsamic vinegar and seasonings that help to tenderize the meat and infuse it with a tangy, slightly sweet flavor. 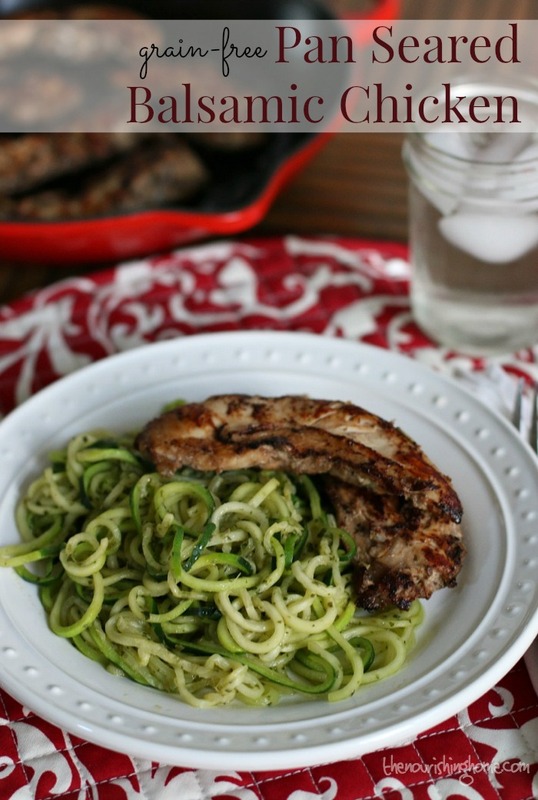 A light dish of fresh pesto zoodles makes the perfect accompaniment to the rich, bold flavors of the chicken. If you’ve yet to make your own pesto, it’s time to break out your food processor and give it a whirl. The key to perfect pesto sauce is to process just the basil leaves, nuts and garlic until the mixture is very finely ground. Then, add the olive oil. This guarantees success every time! For a delicious change of pace, add half of a ripe avocado to your pesto. You’ll be amazed at how creamy and luscious it is. Mangia! Marinate the chicken: Cut chicken breasts in half lengthwise to form strips (tenders). In a 9x9-inch baking dish add all remaining chicken ingredients and whisk well to combine. Add chicken tenders to the marinade. Flip chicken back-n-forth, until well coated. Cover and refrigerate for at least one hour or overnight. Meanwhile, make the pesto sauce, if you're planning to serve the chicken with pesto zoodles (or pesto pasta). If not, skip to step 8. For the pesto sauce: Combine the basil, walnuts, garlic and salt in a food processor. Process the mixture until it becomes a coarse meal. Next, add the lemon juice and avocado, if using. Process on low and slowly add the olive oil to your food processor in a steady stream. Blend just until combined. Add the pesto sauce to zoodles (see recipe note below) for a delicious grain-free pasta dish, or toss with your favorite GF pasta. Also makes a wonderful dip for raw veggies, and a tasty sandwich spread. Yum! To pan sear chicken: Preheat large skillet, preferably cast iron, over medium high heat. Add about a tablespoon of oil to coat bottom of pan. Add chicken tenders and allow to cook 3-4 minutes until browned. Then flip and continue to cook another 2-3 minutes until cooked through. 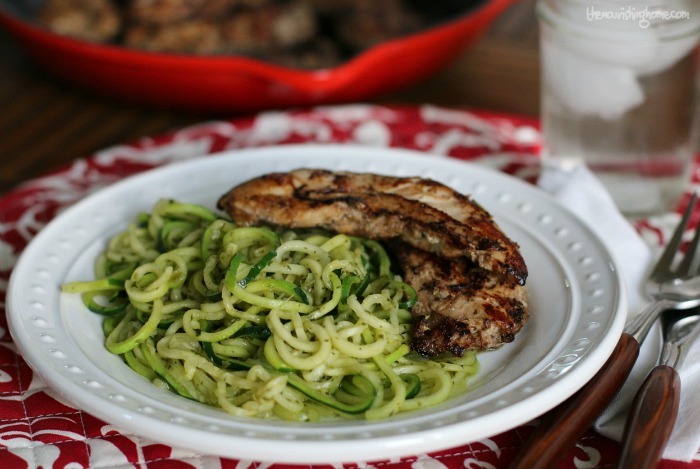 Serve chicken with pesto zoodles for a delicious and healthy meal. Enjoy! 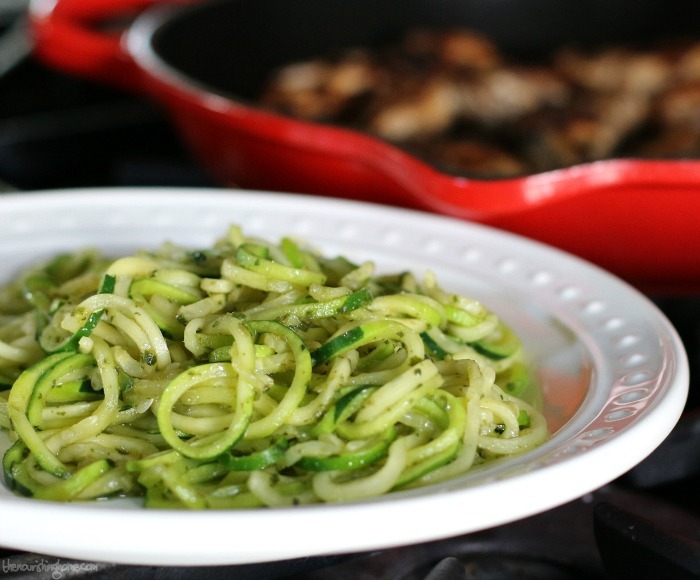 Zoodles are the perfect gluten-free, grain-free pasta replacement. Not only are they full of nutrients, they're delicious and super easy to make. Be sure to check out my How to Spiralize tutorial for details. I recommend spiralizing 2 medium zucchinis per person. Simply steam 1-2 minutes until desired texture is reached. Then toss with this delightful pesto or your favorite sauce of choice. I don’t use balsalmic vinegar near as much as I should be! This looks really good! Thank you for the great dinner idea! This sounds amazing! I bet the creamy noodles are perfect with the chicken. Wish I had some right now! 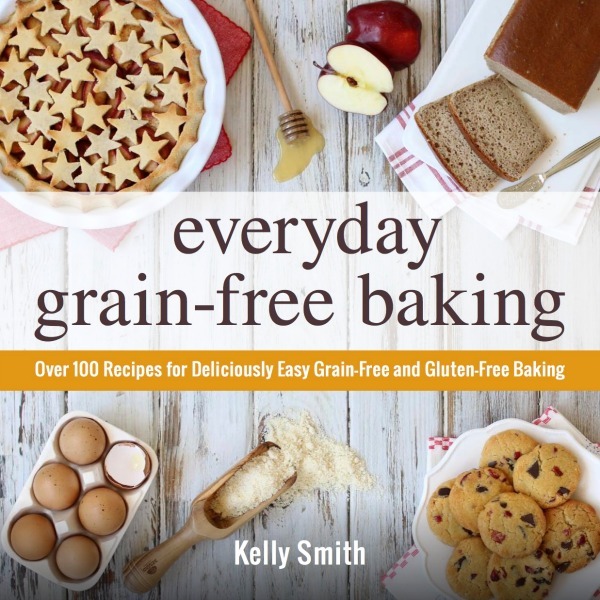 Thank you Kelly for hosting the Whole30 plan on your site. The Whole30 rekindled our love affair with real food. We loved this chicken! Quick and easy and even my children, who don’t usually care for chicken(even nuggets) ate this!!! Thanks for all of your encouragement to eat well! Thanks for all the time you put in on this goodness! Currently using your Whole30 menus and loving them! Even though teaching myself to spend a lot more time in the kitchen is taking so much more effort on my part, its a million times easier with everything you provide!! Yay for teaching healthy habits to the next generation! (I mean every single exclamation mark!) Thanks again! I am preparing for whole 30 and so excited and inspired by your recipe collection – thank you! 🙂 quick question – aren’t nuts out of the whole 30?